Your family has probably already started carving Jack-o-lanterns, hanging up the spooky decorations and – possibly – even worked your way through a bag or two of Halloween candy. With all of the fun family activities and celebrations that make fall such an exciting season, it may be easy to overlook an important preparation for another big holiday that’s just around the corner: Christmas! have to squeeze into last year’s too-small model. That’s why October is the perfect time to do your Christmas shopping! This fall, the most current brands for infants, toddlers, girls and tweens feature luxurious touches of soft velvet, sparkling tulle and rich jewel tones. Fresh for the holidays, Isobella & Chloe offer a sparkling selection of infant girl Christmas dresses all the way up through tween sizes. 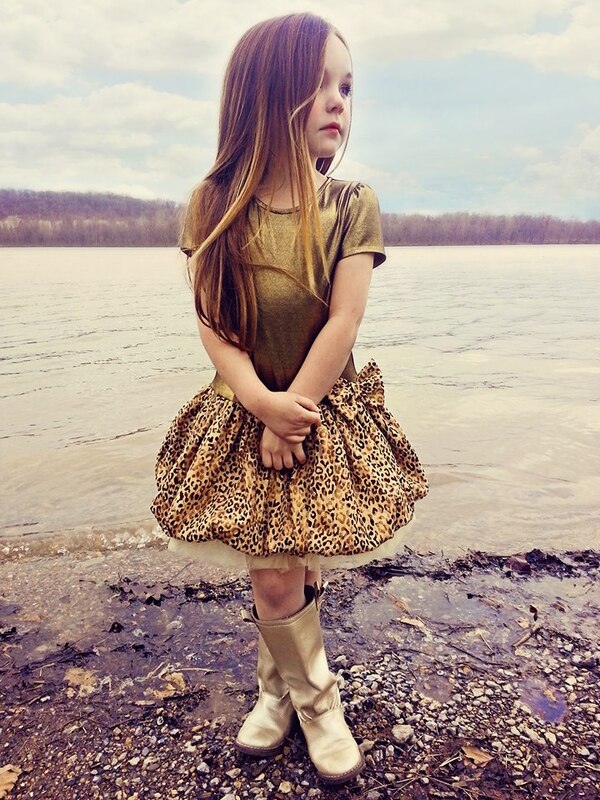 This year’s line is defined by sleek upper silhouettes punctuated by beautiful full skirts, rich color palettes, and thoughtful details – like rosettes and bows – that your little girl will fall in love with. Selections include Isobella & Chloe Plum Kisses, a stunning party dress with a drop waist, floral waist accent and a purple tulle net skirt with a layered, hanky-hem petal skirt. It’s available in big and little sister sizes. For your budding ballerina, the Isobella & Chloe “Prima Ballerina” dress wraps your infant or toddler in a dreamy blend of sliver and pink. Sizes are available for big sisters, too! The fresh new Hallabaloo line is full of adorable styles that manage to look at once youthful, sweet and elegant. 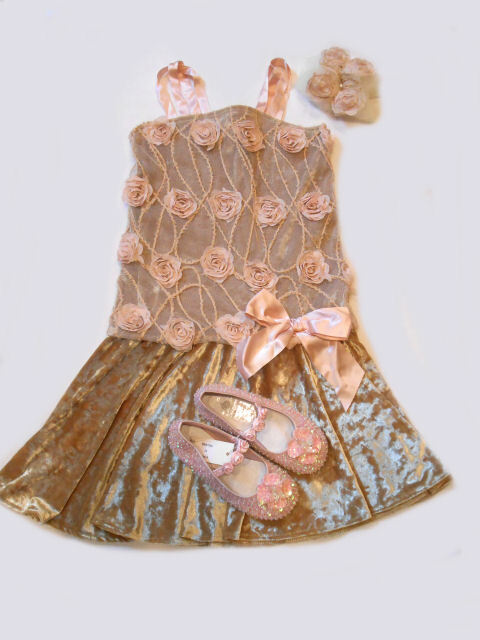 These frocks are all dressed up with intricate details and luxurious touches that really make your girl sparkle. 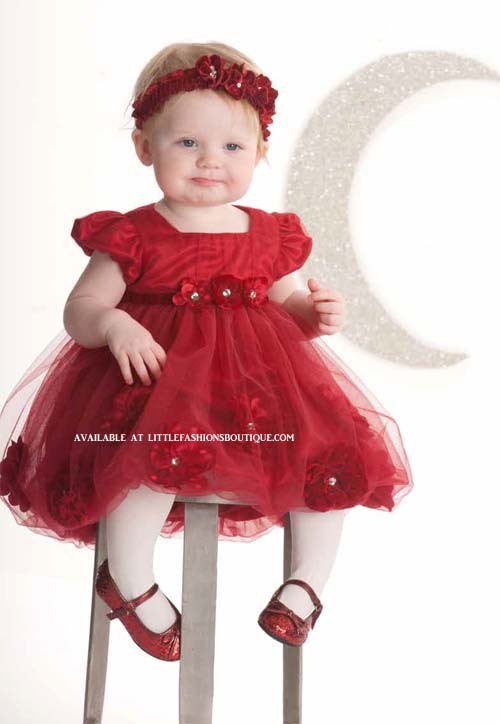 Toddler Girl Christmas dressesinclude the “Fuchsia and Metallic Gold”, a sparkling confection crafted from a gorgeous blend of coral-pink and shining gold. With its gathered neckline, rosette waist accent and super-cute bubble skirt, this dress is sure to stand out in the crowd! For even more shine, Hallabaloo’s “Metallic Silver Bow” dress offers a look that’s the perfect blend of innocence and elegance. With its cute cap sleeves, beautiful bow and sophisticated draped skirt — all in a stunning silver metallic fabric — this girl’s holiday dress matches the glow of the season, no matter what the occasion. If your little girl loves glamor, don’t miss Dolls & Divas holiday line. These adorable holiday dresses will bring a smile to her face and yours, with their shiny sequined detailing and super-cute styling. 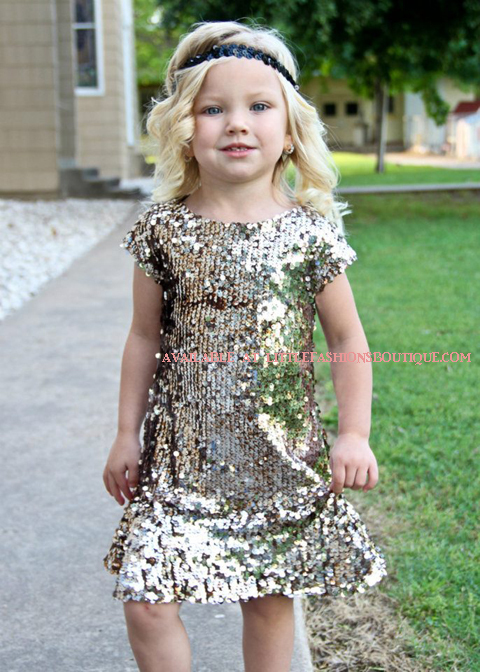 For glitter from head to toe, Dolls & Divas Sparkly Silver & Marble Bronze Flounce Hem Holiday Dress holiday dress makes your girl sparkle with every movement. It also provides that vintage style that’s so fresh this season. For tween holiday dresses, turn to Elisa B. 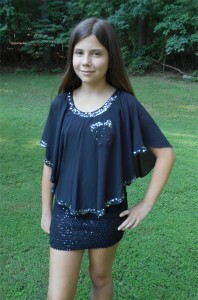 This fresh designer’s holiday looks feature the detailing, rich colors and lux fabrics that are so fresh right now For the Christmas season, Elisa B’s Blue & Black Lace Tween Holiday Dress will dress up any party or dance with its stunning, black flowered overlay and a sequined accent skirt that adds just the right touch of sparkle. Looking for a chic and elegant tween dress, but not over-the top? You are going to love this Elisa B Purple Trendy Cutout Sleeve Tween Mini Dress. This beautiful sleek body-hugging dress is over the knee length and features beautiful cut-out long-sleeves. Inspired by the sophisticated style of Barcelona, Turo Parc’s holiday dresses offer a unique option for your fashion-conscious tween. She’ll stand out in the Turo Parc Navy Blue Gorgeous Plisse Special Occasion Girls Dress, a gorgeous blend of crickle blue sating and balck lace. all dressed up with black alce belt..
For trendy tweens, you can’t go wrong with Sara Sara. This fashionable line is always stylish yet age-appropriate, making it a favorite with both moms and daughters. 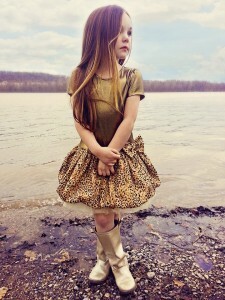 For the holidays, your tween will stand out in the “Tiered Skirt with Sequin Bodice Dress.” Perfect for everything from holiday pictures to parties, this dress features a multi-toned, sparkly sequined bodice over a gorgeous layered tulle skirt, all topped off with a floral waist accent. For truly unique holiday looks, turn to a line that’s inspired by both European chic and California cool. Luna Luna Copenhagen’s Christmas looks include “Anastasia,” a stunning layered tulle dress that incorporates intricate embellishments on the straps and bodice with soft, plush fur detailing, all in exquisite shades of pewter or fawn. This dress looks so rich and lux, it’ll take your breath away. For a festive splash of color, “Babette” by Luna Luna Copenhagen wraps your girl in a brilliant cloud of sparkly, dark-red tulle. It’s topped with a sparkly, smocked bodice and lovely gathered sleeves for a look that’ll make her feel special.